A total of 5,357 adverse events occurred, including 325 serious events and 260 withdrawals due to adverse events. Those taking cannabinoids had a higher risk for dizziness or vertigo, dry mouth, impaired balance, and memory impairment compared with patients on placebo. The study authors, led by Mari Carmen Torres-Moreno, MD, of the Autonomous University of Barcelona, Spain, wrote that although the total number of adverse events was higher in groups using medical marijuana than in those taking placebo, the serious adverse events did not show statistical significance. The researchers used both objective assessments (for example, the Ashworth and Modified Ashworth scale) and patient self-reporting in their analysis. They noted that none of the objective interventions demonstrated a clear efficacy in the treatment of spasticity. Overall, the researchers found that cannabinoids performed statistically better than placebo for pain and bladder dysfunction. The researchers also examined each of the trials for publication bias, excluding any industry-funded studies from their analysis. Physicians who reviewed the analysis cautioned that some of the side effects might affect some MS patients more than others, and that additional research is needed on which specific strains and forms are most effective. In an accompanying editorial, Marissa Slaven, MD, and Oren Levine, MD, MSc, of the department of family medicine and department of oncology, respectively, of McMaster University in Hamilton, Ontario, noted that the benefits of medicinal cannabinoids for MS remain unclear. Drs. Slaven and Levine pointed out that the study authors pooled data from trials that were heterogeneous. In addition, there were differences in the study designs (some were randomized; others, crossover), study populations (MS subtypes were different; some patients were treatment-naive or treatment refractory), and the cannabinoid agents studied were varied. The researchers “have conducted a methodologically sound meta-analysis; however, this does not overcome the limitation of the relatively weak trials that were included,” the editorialists wrote. “In light of uncertainty around clinically meaningful benefit and heterogeneity of the studies and results, they appropriately avoid drawing strong conclusions regarding the role for cannabinoids in managing symptoms of MS.
Others interviewed by Neurology Today agreed. They said, however, that while there was nothing particularly new in the study — uncertainties remained — the fact that the drug was well tolerated was important. But they acknowledged that their patients, in some geographical areas more so than others, were either trying medical marijuana or asking about using it. Gregory T. Carter, MD, a physiatrist and clinical professor in physical medicine and rehabilitation at the Elson S. Floyd College of Medicine at Washington State University, said about two-thirds of his MS patients used some form of cannabinoids and overall they've had excellent results, although patient-reported success is not always reflected in actual measurements. “There are so many different formulations of cannabinoids, some are 50/50 cannabidiol and tetrahydrocannabinol [the psychoactive component], and with the overall limited number of studies, there's a limit to what you can conclude about efficacy,” Dr. Carter said. Sunil Aggarwal, MD, PhD, FAAPMR, who specializes in palliative and rehabilitation medicine and is clinical faculty at the University of Washington School of Medicine and an associate hospice medical director at Multicare Health System in Tacoma, WA, said he wasn't surprised by the results of the meta-analysis. He commented, though, that excluding industry-sponsored trials could have diluted the effect size of the findings. Allen C. Bowling, MD, PhD, an MS specialist and clinical professor of neurology at the University of Colorado, pointed out that the cannabinoids used in medical studies are pharmaceutical grade, whereas many products from state dispensaries have never been tested for efficacy or safety, may have incorrect labeling, and may contain contaminants, such as pesticides, solvents, or heavy metals. He said a minority of his patients use marijuana, mainly for pain and spasticity, and some of them stop because of the side effects. Dr. Bowling said he was concerned that patients would look at the final line of the study stating that medical marijuana was safe for MS and not be informed of potential side effects. Some of those side effects, like poor balance, vertigo, and cognitive fog, would particularly be problematic for MS patients, he said. Michelle Fabian, MD, an assistant professor of neurology at the Icahn School of Medicine at Mount Sinai and an attending physician at Mount Sinai's Corinne Goldsmith Dickinson Center for Multiple Sclerosis, said about 15 percent of her MS patients use medical marijuana. She said it's important that patients realize that medical marijuana only addresses symptoms, that it is not a treatment for MS, and that only a portion of people respond symptomatically. “It is still a drug, and although this study says it's safe and it's probably safer than many of the neuropathic medications we give people, there are still adverse events such as cognitive dysfunction and psychiatric side effects, and some of my patients feel more unsteady walking,” Dr. Fabian said. Because there are so many strains of medical marijuana, as well as different dosing and ways to take it, it's often hard to rely on studies to make recommendations to patients, the physicians said. Dr. Fabian said she tends to suggest higher THC oils or vaporization for those with more pain, and higher CBD concentrations to address spasticity. But she said it's up to those in the marijuana dispensaries to work with the patients to adjust the final product. •. Torres-Moreno MC, Papseit E, Torren M, Farre M. Assessment of efficacy and tolerability of medicinal cannabinoids in patients with multiple sclerosis. A systematic review and meta-analysis https://jamanetwork.com/journals/jamanetworkopen/fullarticle/2706499. JAMA Network Open 2018; Epub 2018 Oct 12. 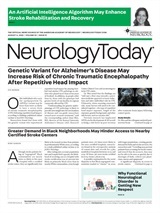 Neurology Today18(23):12-13, December 6, 2018.